Mesa founder Randall Smith based some of his early, pre-Mark 1 amplifier designs on tweed-era Fender circuitry. Although he ultimately found that those Fifties-era circuits didn’t provide the clean response he was looking for, he remained a fan of their sonic qualities, particularly when they were driven into distortion. Fast forward to 2018, and Smith’s most recent guitar-amp design, the Fillmore 50, debuts as a simple (at least by Mesa standards) tweed-based amp that features two identical or “cloned” channels (each with a Clean/Drive/Hi mode switch), a tube-driven spring reverb, an effect loop and a global half-power switch. The combo version on review here carries a single 8Ω Celestion Custom 90 speaker, which is driven by a pair of 6L6 power tubes generating 50 watts in Pentode mode and 25 watts in Triode configuration. The Fillmore’s black Tolex covering and side-by-side channel arrangement makes it all very familiar for players of classic blackface amps, while the black-and white woven grille cloth and white piping bring some Boogie Mark 1 vibe to a package that weighs a modest 45 pounds. Inside the aluminum chassis we find most of the circuit components mounted on a main PC board, with neatly routed flying leads connecting the chassis-mounted potentiometers, jacks and switches. For added strength, the sockets for the power tubes are mounted to the top side of the chassis as well as to a smaller board below. 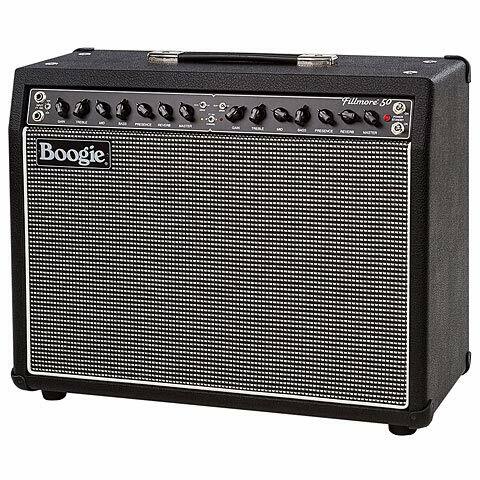 Overall, the rugged layout and clean workmanship inspire confidence that this amp will hold up well over the long haul. In fact, Mesa sent me a Fillmore 50 combo while I was on a short road trip this summer, so not only was I able to give the amp a good deal of stage time, it was also subjected to being jolted around in a van for dozens of hours. No glitches occurred, and the Fillmore delivered consistently great sounds with zero fuss. Selecting the Clean setting on the left channel and Drive on the right allowed me to toggle between crisp, clean country twang and a more distorted version of the same using the included single-button footswitch. The amp’s overdriven tones were so happening that I barely touched the distortion pedals that normally see a lot of action with my Fender Deluxe Reverb. Mesa has carefully worked out how the Clean/Drive/Hi switches affect the response of the channels. I’m told it took a lot of experimenting to get the feel, frequencies and overall voicing just right. Once you have the switches set for the kinds of sounds you want, it’s just a matter of dialing in the gain controls as needed to cover anything from ultra-clean tones to highly overdriven textures with tons of sustain. It’s all in the spirit of making the Fillmore 50 suitable for everything from jazz and blues to alt-country, hard rock and beyond. I also dug how accommodating the tone controls are to different guitars. For instance, when switching from a Tele to a Les Paul, I often just kept the treble knob around 11 o’clock and the presence low, and then used the far-reaching mid control to adjust brightness as needed. The Fillmore is very big and dimensional sounding for a 1×12 combo, and its spring reverb delivers everything from sweet, blackface-style reflection to dripping-wet textures, all beautifully integrated with the amp’s core tone. Although it’s loud and crisp on the 25-watt setting with the masters dimed, the Fillmore definitely has more headroom and punch when running at 50 watts. I used it both ways in a group with loud bass and drums, switching to full power in certain rooms and outdoor spaces when more cutting power was needed. The Fillmore also superbly presented the qualities of pedals that I ran into its front end, including an EHX Big Muff, a Demeter Tremulator Plus and an MXR Phase 99. I think anyone who uses Fender combos with boost or distortion pedals will appreciate where the Fillmore 50 is coming from. The way this amp takes that basic configuration to new performance heights makes it a welcome addition to the Mesa line and an easy winner of an Editors’ Pick Award. Well done!